Picking a career path for yourself is a tough task indeed. If you have decided to be an entrepreneur then you should be warned that your journey ahead is not going to be an easy one at all. Entrepreneurship implies starting your own business right from scratch and with all the success stories all around it might seem like a glamorous line to enter. However the fact is that in reality this career path is one that has very little glamour, a great deal of hard work and some luck as well. 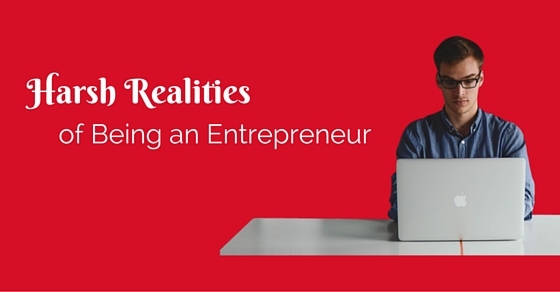 To help you here are some hard realities of being an entrepreneur. Being an Entrepreneur – How to Survive The Dark Side Of It? Being an entrepreneur does not imply that overnight you will be making a lot of money and you can start living life on your own terms. Rather, initially things are going to be so tough that you might find it tough to make two ends meet and keep your head above water. So much so that many times along the way you might think that you ought to forget about this dream of yours and move on. However if you have your heart and mind set on this career path then you should not allow money to deter you in any way. If you work hard, things will work out. Deciding to become an entrepreneur is a big decision indeed which you should only take if you think that you have the skill, ability and perseverance to go all the way. Be prepared for the fact that your family members might not understand what you are going through and if they find that after a year of struggle you hardly have anything to show for it, they may begin to demoralize you. It is only someone who is an entrepreneur that can really understand what you are going through and can really tell you that yes it is tough in the beginning but don’t give up. It has never been that a business has become a success in one day or overnight. It takes plenty of time and maybe even years of struggle. Just because you are in a hurry to get your business off the ground, that does not imply that everyone else you are working with is going to be cooperative and obliging. Whether it is getting the factories to make your products faster or whether it is getting permission from certain government bodies, be prepared that things are going to take possibly twice as long as you initially imagined that they would. One of harsh realities of being an entrepreneur is that you cannot pin all your hopes and dreams in one place or in one contract. A deal or a contract which unofficially seemed to be signed and sealed might not work out the very next day. You should just accept this that something that was not meant to be and try your best to move on. Disappointments like this will not be easy to accept initially however over time you will realize that the only thing constant in the business world is change and anything can happen at any given moment, so don’t think it’s your fault. You might have entered this career path as you thought yourself to be a people’s person that has a way with words. However once you actually enter this line and begin to converse with customers and get to know how they really are, you will be in for a rude shock. Since they are paying their hard earned money for products and services they will not be forgiving and the way they speak to you and make demands might not be something which you will be able to take lying down. However since your business depends on them, you should endure it all. There is some truth in the common saying that failure is the stepping stone towards success, however once you decided to be an entrepreneur you have to realize that failure is not something that will take place once or twice in your career. If you do not want to be in a for a shock then you ought to mentally prepare yourself for the fact that you will be facing multiple failures on a daily basis and things will not go in your favor at all. Even then you should not let any of these things affect you physically, mentally or emotionally. You might have thought that when you become an entrepreneur working with your friends is something that you will love doing as they will always be there to guide you and help you along the way. However working with friends is something that hardly works out and when even the best of friends are unable to see eye to eye on business decisions then their relationship could easily go sour. So this is indeed a harsh reality which is all part and parcel of becoming an entrepreneur. You might additionally also find it so challenging to pull up your friends for doing something wrong. Entrepreneurs come up with ideas after a great deal of effort. Over time an idea which you conceived might become a part of you and no matter what, you would like to watch it succeed. One of the harsh realities of becoming an entrepreneur is that sometimes an idea may look good on paper but it just might not work out for reasons you might not be able to comprehend. Give it time, however you should be able to know when to let go and put the efforts to rest. Remember it may be a good idea, but if it’s not making you any money, then what’s the point? A harsh reality about being an entrepreneur is that if you are not truly passionate about your business it will not take off. If you are genuinely passionate about something then only will you really be able to put your mind into trying to make it a success. Be an entrepreneur because it is your dream to become one, and not because someone is forcing you to become one. Things will never work out if you feel like it is a burden to you. If you are truly passionate about this line you will think of each day as a new adventure before you, waiting to be explored. Being an entrepreneur implies that you will have no fixed hours of work. Be prepared for the fact that sometimes you will have sleepless nights as well. Just because one of your ideas has been a success that does not mean that you can take the next few weeks off and bask in your glory. The key to being a good entrepreneur is that you are constantly on your feet thinking of ways in which you can take your business to greater heights by looking into things like the services which you provide, the feedback of customers and the quality of the products which you sell. The task for hiring employees is something which you will find most challenging. There are many people who will tell you they are qualified and able, when they are actually not and there will be others who will leave you, the moment they realize that they have better options elsewhere. So what you must do as an entrepreneur is try your best to ensure that you employees are happy and content. The smaller the team you have, the better it is for you as you will be able to keep your expenditure to a minimum as well. When you are an entrepreneur initially you might find yourself at sea, yet one of the biggest mistakes you are likely to make is being too trusting whether it is with an employee or a partner. No matter what, you should never share too many business secrets with anyone because in the business world no one is your friends and they might betray your trust in a terrible manner at a time when you least expected it. The truth and hard reality of being an entrepreneur is that there will be many people who will always be trying to give you their opinions and criticisms whether you asked for their thoughts or not. Sometimes it is okay to take into account valuable criticism which is being given, yet sometimes since you are the captain of the ship, you ought to trust your own instincts and abilities because trying to cater to too many wants as well as needs will confuse you. Keeping things simple and not listening to those that are trying to tear you down will help you along the way. A harsh reality of being an entrepreneur is that choosing to have a partner could be one of two things. Either it could be the best decision or worst business related decision which you made. You should keep your mind when deciding on whether your business needs a partner or not. When you become an entrepreneur, be prepared to kiss your personal life good bye. Your primary focus in the initial years of your entrepreneurship should always be your business. You might have to put a number of things in your life on hold that is why you might find that when you choose to become an entrepreneur and start working towards achieving your dream you will lose some friends along the way. Yet those who want to be in your life will understand and try to find a way to always support you. As you become successful many people who you thought would be happy for you will grow incredibly jealous of all that you have achieved. But you should not get such negativity get to you and when you have worked hard you should not feel bad about yielding rich dividends. However make sure that at no point in time do you let any of your success go to your head and change you to someone who is proud and egoistic. One harsh reality which you need not worry about when you are young is that once you have grown older and tasted entrepreneurial success it is unlikely that you will ever feel like retiring, Yet you should know when it is time to give up and when to pass on the torch to your prodigy. Next articleHow to Succeed in the Coding Interview?